Note: Collects the first five monthly issues of the Dark Ark series #1-4. Chocolate, vanilla, existential horror, addiction, musical fantasy…there’s a flavor for everyone’s misery. 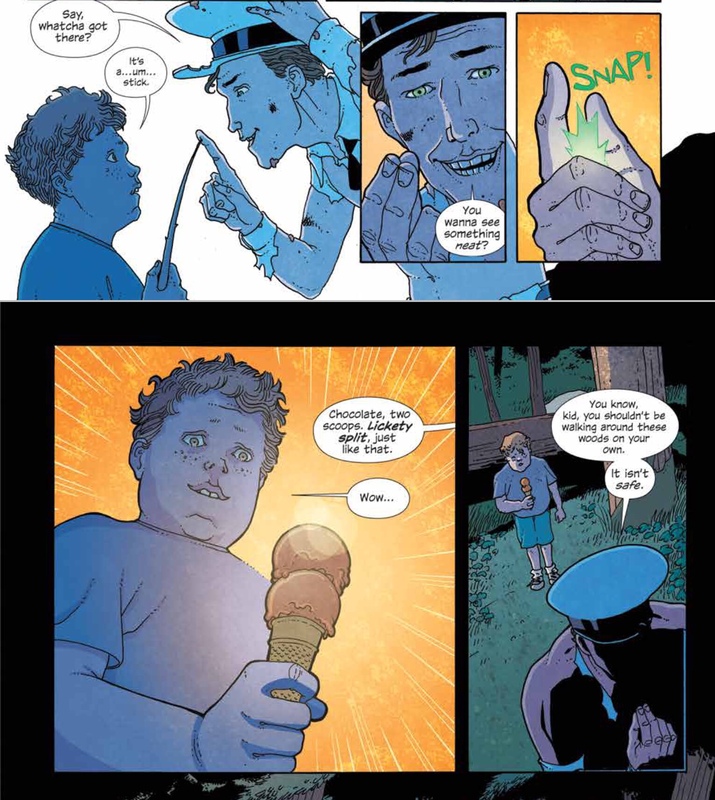 Ice Cream Man is a genre-defying comic book series, featuring disparate “one-shot” tales of sorrow, wonder, and redemption. Each installment features its own cast of strange characters, dealing with their own special sundae of suffering. And on the periphery of all of them, like the twinkly music of his colorful truck, is the Ice Cream Man—a weaver of stories, a purveyor of sweet treats. Friend. Foe. God. Demon. The man who, with a snap of his fingers—lickety split!—can change the course of your life forever. 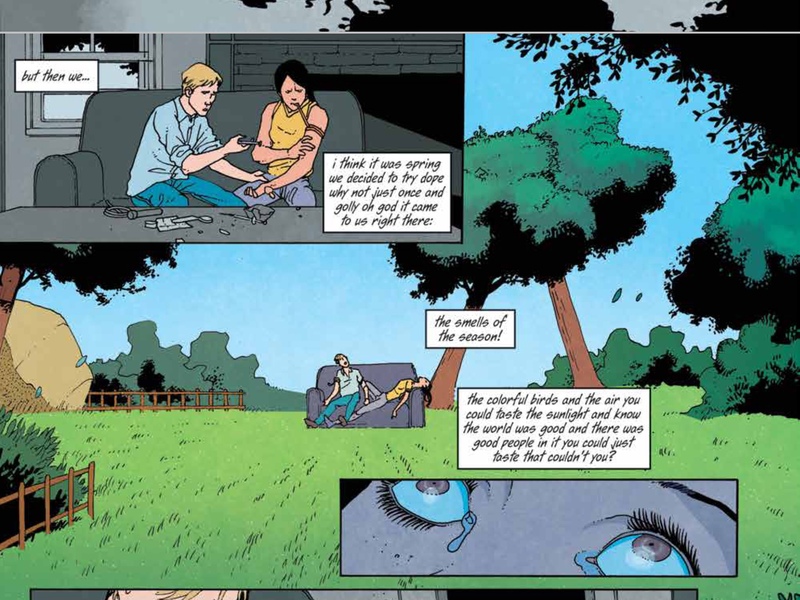 Ice Cream Man is an odd enigma of twisted stories, where the reader gets a taste of Americana life mixed with sadness and horror. I picked up this series from the comic store, wanting a new flavor in something different to read. Not sure why this caught my attention, other than the nostalgia of an Ice Cream man on the cover, with something to share, but something is not quite right. Something about the trust an ice cream man gives in his delivery, as just a simple man selling ice cream from a truck. I get a little Stephen King classic vibe to the setup here. And so goes, four unique and strange stories of personal lives, woven by this charismatic ice cream handing trickster. At least, that’s what he are lead others to believe, as lives slide through disjointed spirals, each towards a crunchy end that may or may not be savorable. The stories are of different flavors, with the elements of good characterization and set-up luring us in with good solid storytelling. Each chapter leads to some stranger journey of a lead character in some delusion, chasing a dream; losing the self in some way. The Ice Cream Man sort of just moves on, after his work is done; smiling and scouting for the next victim. I am not sure why I enjoyed this first volume. There is no solid characters to get behind, though I can identify with some desires presented. There are supporting characters involved, where I think some drama lies toward how each ends up affected. I don’t want to spoil the setup of players in each tale, as I think its best for the potential reader to investigate. But, do expect the unexpected. Meanwhile, there develops a bigger picture with the titular Ice Cream Man. He remains the biggest mystery, whose goal is unclear beyond his twisting of local lives to some inner thrill using some bizarre magical power.. Maybe he is the devil, or just a mythological trickster in new form. There is a hint towards the end of an overarching story, and a possible foil to his design. The art is good enough, through likely not the choice flavor for all readers. The overall presentation is nothing too spectacular or multi-layered, but serve in keeping the tone and mood of each story in a sort of light innocence with everyday settings and suburban Americana faire, initially. Then if feeling captivated, something dark and twisted comes along with no warning, or some strange turn to the end leaving room to ponder each conclusion. So, if you like your horror tales with sprinkles of melancholy and weirdness added tingle those reading senses; than give this volume paperback a lick.